If a picture’s worth a thousand words, imagine what the image board can do for a writer. Justine Musk is months away from finishing her novel. But even though she hasn’t told them, her fans already know what the main characters look like. That’s because Musk is using Pinterest to map out her latest psychological thriller, The Decadents. The Los Angeles author pins images that resonate with the story so far, in which a young dancer traumatized by visions of her past life is caught in a love triangle that threatens to result in her death. Unless, that is, she can uncover the truth about a twenty-year-old murder. Seven hundred readers follow her vision board to track Musk’s latest inspirations as she works. Some readers have been able to figure out plot points, she said. “There was one long comment after a post I did about Pinterest on my blog that intrigued me: the commenter was able to nail some of the themes in the book, the nature of the characters, just by looking at the images,” she told the Daily Dot. Pinterest’s minimalist visual interface can be used for virtually anything from business promotion to rating movies. Musk is the first person we’ve discovered using the site to plan out a novel, but we weren’t surprised when she said it was a perfect fit. The divorced mother of five boys (two twins, three triplets), said she didn’t discover Pinterest so much as it “seeped into [her] consciousness,” and she started seeing her Twitter followers use “pin” as a verb. She started up her own Pinterest account this January with the intent of using it to plan out her novel. When we asked to interview her about her writerly use of Pinterest, she expressed surprise that it wasn’t a wider practice. “People … seem to think it’s an unusual way to use Pinterest, which actually did surprise me, because it seemed a natural and obvious thing to do with the site,” she told us. Musk is already familiar with harnessing social media as a novel writing tool. Before Pinterest, she was a regular on LiveJournal, where she blogged to promote her first published book, a dark fantasy called BloodAngel. 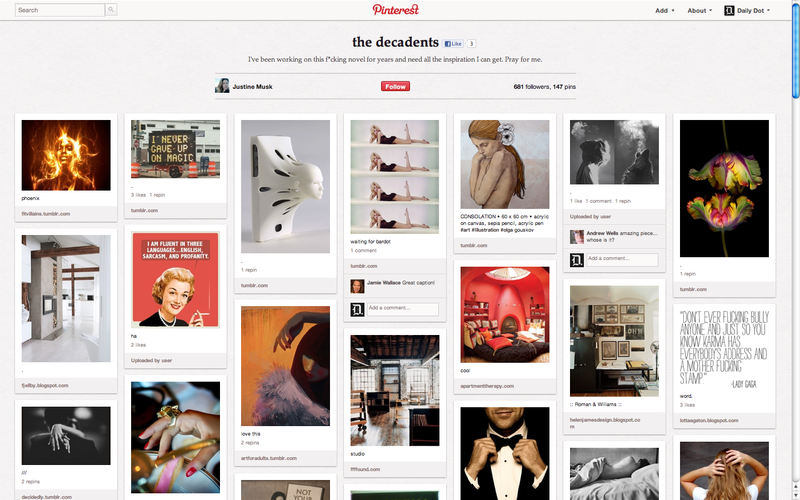 Now, she’s gotten into the habit of using Pinterest as a supplement to her notes for The Decadents. She repeatedly pins photos of ballerinas in order to convey the novel’s dancer heroine. She pins quotes and interiors that capture the luxe, edgy aethestic she’s trying to achieve. “It’s a great complement to my usual notes and outlines and mind maps because it’s a visual representation of the storyworld I’m trying to convey,” she said. Musk plans to release The Decadents next fall. Until then, you can track her progress as she updates the board near-daily with new material. Of course, this schedule all depends on whether she can get away from Pinterest long enough to stick to her writing schedule.